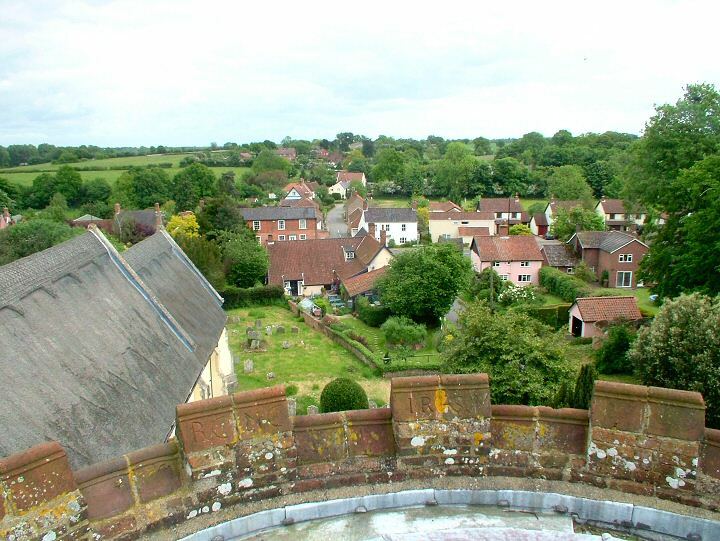 Looking due South from the tower of St.Andrew's church in the centre of Bramfield towards the back of the Queen's Head public house and the crossroads. The thatched roof of the Church is on the left, seemingly close but actually detached from the ancient tower. Note the initials carved into the tower bricks. The A144 main road is out of sight but runs horizontally across the middle of the picture. The lane clearly visible is wending its way past the village hall and school, eastwards to Wenhaston just two miles away.